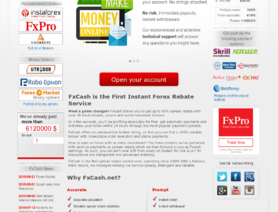 I started to work with fxcash.net. I already withdrew few rebates. At this moment everything is perfect. Trader30 also left reviews claiming to be in Tbilisi, Georgia. FxCash is the best i think. 4 years i'm with them. Fastes service, best rebates. This review came from the same location used by a representative of FxCash.net to register for the forums. Review Moderation Team Note: 5 Star rating removed. This review came from the same location that FxCash.net's representative used to post in the forums.